Do you plan to cut back on conference attendance this year? There is a new breed of conference popping up. They offer the convenience of attending from your desk. Or the in-depth education received from small-group settings. And they usually boast registration costs far below those of the large events we’re used to. Susan returned from Florida this weekend, but I didn’t need to wait for her account to know that something special was going on in the Sunshine State. At IM Spring Break, an in-your-face group of about 100 gathered for sun-soaked learning and laughing. With a performance by David Szetela and Jeff Quipp’s SEO Band and platters of cookies served pool-side, there’s no denying the fact that attendees were playing just as hard as they worked. As Shana Albert of Social Desire explained, the size of the conference meant that attendees built lasting relationships because of intimate conversations. That’s quality networking right there. And during presentations and keynotes, attendees weren’t just another person in the crowd. The Q&A after presentations were an integral part of sessions and speakers responded to specific and targeted questions. Then there are the purely digital conferences. 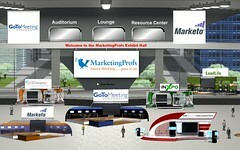 Last Wednesday MarketingProfs held its annual Digital Marketing World conference. Considering that #mpworld was the number two trending topic on Twitter that day, it’s easy to see how the growing popularity of Twitter added a new dimension to this year’s event. And the digital format is remarkably functional for a conference. There were nine sessions offered throughout the six hour event and even if you missed it last week, everything is available on-demand until July 1. Did I mention that the conference is free? About 14,000 people registered for the event and while no one was turned away, it never felt crowded. There was a lounge area designated for networking. There was a hall where exhibitors offered white papers and reps were ready and waiting to answer all your questions. Presentations included the slide shows and Q&A periods expected of any good webinar. In the tight economy we’re facing, it makes sense that companies are looking to cut costs. Travel is one of the target areas, with some replacing business class with coach and others trimming conference attendance. During the summer of last year, OrbitzForBusiness.com reported that “companies are reducing trade show and conference travel, with 44 percent either sending fewer people or simply not attending shows this year.” This month BusinessWeek reported a surge of interest in videoconferencing as a way to reduce travel budgets. So what do you think? Are these new conference incarnations the future of industry events? I was at IM Spring Break and have to say it was great. Small size and laid back feeling just made everyone open up and share. A lot of ideas were explained in detail and discussed by the best in the SEO and social worlds.